How to Configure LDAP / Active Directory Authentication in Office Chat? You are here: Home / Administration / How to Configure LDAP / Active Directory Authentication in Office Chat? 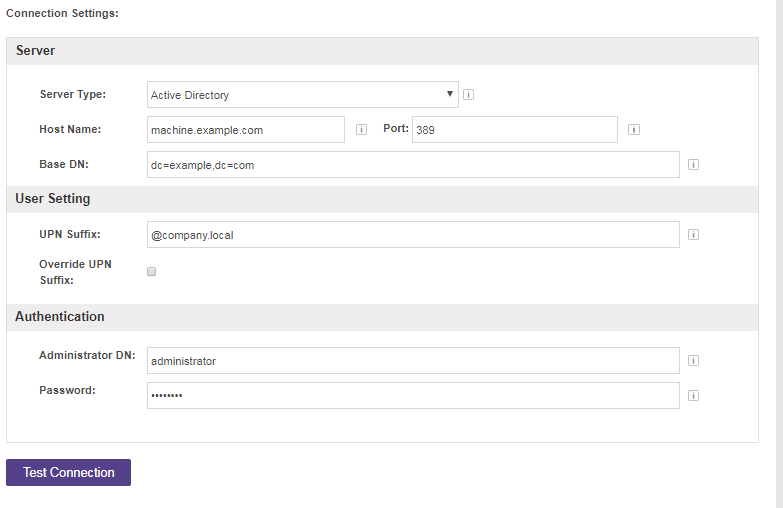 Where can I find the LDAP configuration settings in the Admin Portal? What access do you need to integrate your active directory / LDAP server? What do the different configuration fields mean? Server Type & Account/UPN Suffix: You have a choice between “Active Directory” and “OpenLDAP” servers. Choosing “Active Directory” enables the additional “User Setting” section where you define the account suffix (UPN Suffix) that is configured for your AD. Host Name & Port: The LDAP server and port you are connecting to. Base DN: The base distinguished name of your LDAP used for the base search. Administrator DN & Password: User authentication for a user that has search capability and is able to perform all read-only directory operations. What do all the fields mean in Connection Settings of the LDAP/AD configuration Page? Server Type & Account Suffix: You have a choice between “Active Directory” and “OpenLDAP” servers. Choosing “Active Directory” enables the additional “User Setting” section where you define the account suffix (UPN Suffix) that is configured for your AD. Host Name & Port: Enter the name of the server where your AD/LDAP is hosted, example: ldap.example.com. Also, enter the port on which your directory server is listening, examples: 389 (non-SSL LDAP), 636 (SSL LDAP). Groups Base DN: is the base distinguished name of your AD used for the base search. Administrator DN & Password: User authentication for a user that has search capability and is able to perform all read-only directory operations. Enter a distinguished username & password of a user that will allow Office Chat to connect to the directory server. Connecting to the directory server requires that Office Chat log in to the server with the username and password configured here. For Step 2 of Configuration, what do I put in each of the fields? Note: All user profile fields will be synced when the user logs in or a manual sync are performed. 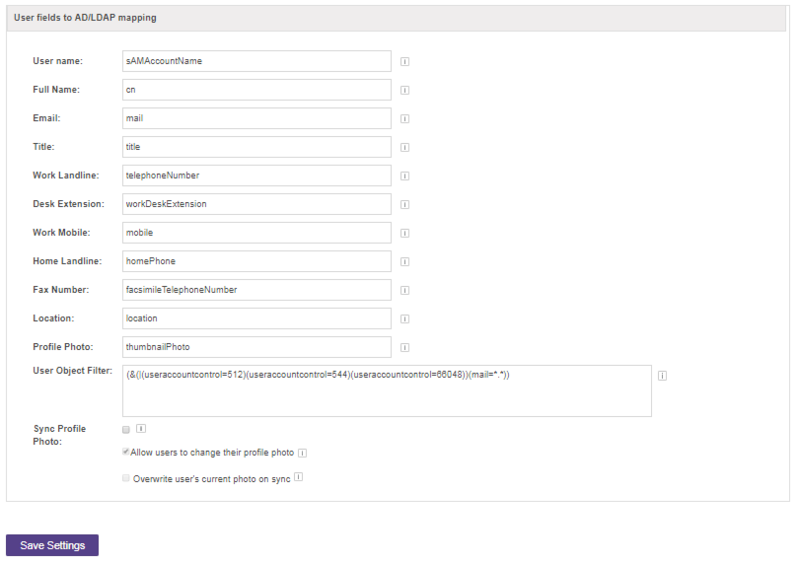 Username: The field name on which username lookups will be performed on. If this value is not set the default value is uid. Active directory users should try the default value of sAMAccountName. Full Name: Users’ full names. Work Landline: The mapping for users’ work landline telephone number. Desk Extension: The mapping for users’ work desk extension numbers. Work Mobile: The mapping for users’ work mobile phone numbers. Home Landline: The mapping for users’ home landline telephone numbers. Fax Number: The mapping for fax information. Translated this means: search for objectClass=person OR object=user. The pipe symbol ‘|’ denotes ‘OR’. As this is not a special XML character, it should not need escaping. This way you don’t have to create any new OUs or move records around. You can simply modify department membership attributes on the user, something the LDAP administrator can do. Where can I find references on LDAP filter syntax? A more general one on LDAP. Customer user filters range from very simple to very complex. Here are two examples. Notice that one customer differentiates by “postalCode” and another uses various “useraccountcontrol” values. What tools can I use to troubleshoot the LDAP filter for too few or too many users? We use the command-line tool LDAP search. There are other command line and graphical utilities out there. Please let us know if you have a specific question about setting up your LDAP filter. How often should I manually synchronize my LDAP configuration? Since the changes to your LDAP users are applied every day, there’s no need to manually synchronize unless you’ve made changes to your users that you want to see in Office Chat right away. Can I “Suspend” or “Change Users’ Passwords” in Office Chat when Authenticating through LDAP? When LDAP is enabled, it controls all users in your domain. Suspending or changing users’ passwords will not affect LDAP users, only those guest users or network users that are not part of your LDAP. Do LDAP settings overwrite mapped values that user may have changed in Office Chat on Sync? LDAP, for the most part, is treated as the master record of user data when synchronizing with Office Chat. Mapped user data that users may have changed in Office Chat will be overwritten with their LDAP mapped field when an LDAP sync occurs. So fields like “User Name”, “Email”, “Title” and “Work Landline” that are Office Chat fields will be overwritten by their LDAP mappings. How do I log in once LDAP is configured? Users log in to Office Chat using their unique identifier (UID) and LDAP password once LDAP is configured in Office Chat. Passwords are controlled through LDAP so users and admins cannot change passwords from Office Chat but rather passwords must be changed in LDAP. When and how frequently is AD synchronized with Office Chat? 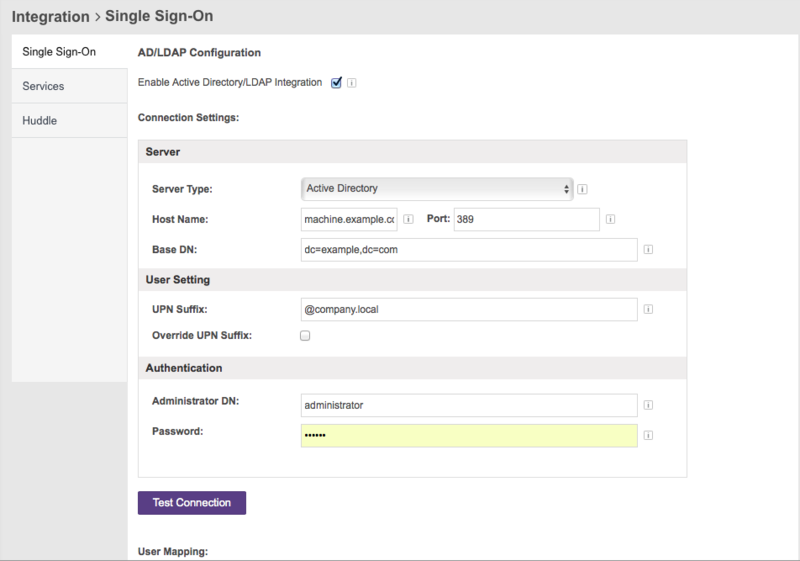 Go to the “Admin Portal” -> “Single Sign-On” -> “LDAP / AD” page. If your configuration has already been saved, at the very bottom of the page, place a check in “Auto-sync Office Chat with enterprise AD/LDAP” choose between once every or every hour and click “Save”. 1. User gets activated/deactivated(if setting enabled). Once every 24 hours, a full sync will be performed that will include everything.